The first loop-powered Saab is here. 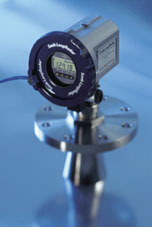 Born to provide reliable, continuous and maintenance-free level measurement in all your storage and buffer tanks. Saab LoopRadar ™ is just what you’d expect from the world leader in radar-based level measurement – and it’s still surprisingly affordable. Since it’s loop-powered, Saab LoopRadar uses the same two wires for both power supply and signal output. This means easy, inexpensive installa-tion and integration with your existing systems, which keeps cabling costs low. For remote read-outs, the level outputs are transmitted as analog 4–20 mA signals and as digital HART® signals. Of course, Saab LoopRadar still provides all the features and benefits of a Saab radar level gauge. A measuring range of 0–20 m, with an accuracy of ±10 mm, is excellent for a loop-powered radar gauge, along with outstanding signal reliability and repeatability. And its maintenance-free, self-calibrating construction with no moving parts or physical contact with the liquid, is guaranteed to keep maintenance costs at a minimum. In short, this little gauge means big returns for your business.